The database provides dozens of Scripture verses and early Church quotes to support all of the major Doctrines of the Church. Search over 10 Bible translations, hundreds of early Church doctrines, and over a thousand classics covering 2000 years of Christianity all at one time. 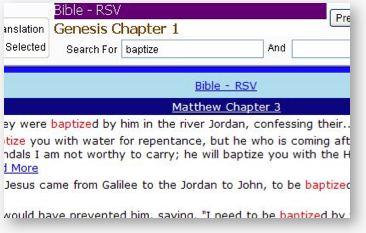 Create your own topical bookmark list referencing both Scripture verses and quotes from Church documents, Fathers, Doctors, Councils, Encyclicals, and classics. Bible translations, Ecumenical Council documents, Early Church Fathers, Doctors of the Church, Christian classics, Bible art, Bible maps, and more. Links to many online resources. 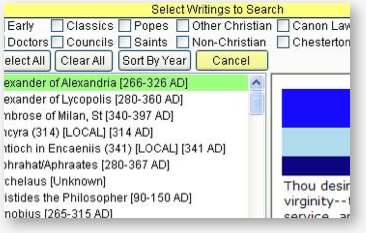 Export any documents or search results to Word, Excel, or PDF files. Select from over a dozen formats to export. Excel, HTML, TIFF, BMP, PNG, GIF, JPEG, PDF, Open Office, RTF, Word, XFF, XPS.